Casa Del Mar is an oasis of calm, with its seaside location and surrounded by formentera pines. This haven guarantees seclusion away from the crowds with a luxurious infinity swimming pool and various chill out areas all overlooking a perfect sea view. Casa Del Mar is located in the area of Migjorn which is considered one of the most beautiful spots on Formentera. It is perfectly located to take in the marvellous sunsets on the sea front less than 100m from the house. This villa guarantees maximum privacy and usually hosts an array of international clientele – actors, politicians, famous musicians, financiers and it is possible to organize many services for film sets, advertising spots and meetings. Recently renovated to make the most of the ocean panorama, Casa Del Mar has style & sophistication. The 5 double bedrooms are arranged around the courtyard and all have ensuite bathrooms. Three of the bedrooms can be used with twin beds. This magnicent villa has a large open plan living room that opens out onto a private & spacious courtyard, with multiple chill out areas around the property. The lounge has plenty of comfy sofas and is equipped with satellite TV, stereo, and wifi. The kitchen is fully equipped including a dishwasher and has a dining table that seats 8 people. An office/library is located off the lounge and there are 2 safes for storing valuables. Daily cleaning service, chef, professional masseuse & 24 hr boat services to/from Ibiza avaible on request. A baby cot is also available if required. The outdoor living at this casa is fantastic, with large sea view terraces, one with a large dining table seating 14 people and a bbq for that all important al fresco dining. Various chill-out areas are locted around the property and next to the infinity swimming pool which has panoramic views to the mediterranean. It has private parking and a garage with 2 washing machines and 2 refrigerators. Casa Del Mar has very easy access to the sea in front of the infinity swimming pool with chill out decking areas and many sun loungers. The property is bordered by the sea to the south, by a small valley to the east, and by a finca to the west, whose owners live there all year. The access road is private and only used by the residents. 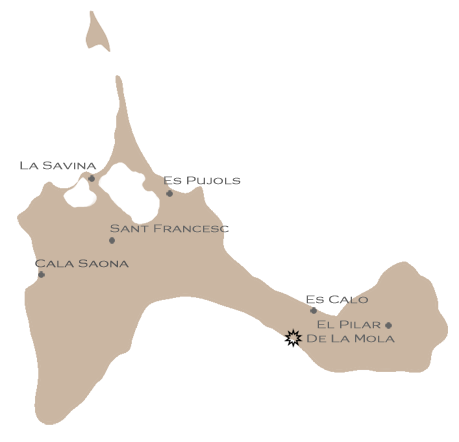 The casa is located in Migjorn in the area of Es Ram- 13.4 km from the port. Lots of amenities are available nearby with excellent restaurants specializing in seafood and the local cuisine. Es Calo is a short cycle ride away with its lovely beach and many shops/restaurants.